We’ve completed a re-discovery of the Performance Platform. This is the third in a series of posts in which we explain why this was necessary, what we’ve learnt and what we’re planning for the future. In our first and second posts we looked at why we decided to undertake a re-discovery of the Performance Platform and what we found during that discovery. In this post we’ll look at the next steps for the Performance Platform. The discovery demonstrated that we have to change direction. The Performance Platform has to stop trying to be all things to all people, and become a focused product that meets our primary user’s needs. We’re now doing just that. We are planning to build a simpler, clearer and faster performance product. We are exploring high-level metrics and standardised data that will help our users identify the next most important thing to focus on. What are the consistent and useful metrics to share centrally and publicly? What is the right rhythm of data publishing? Is realtime actually necessary for our user’s needs? How do we make it as easy as possible for people to supply data? What are the governance needs to ensure quality, auditable and reliable data is supplied? How do we respond to any failure to supply? It’s important for us to keep asking who our users are and how we can find ways to better meet their needs. The danger is that we get locked into iterating on a solution when the users and their needs have changed. In this case, iteration wasn’t enough, we’ve learnt not to be afraid of going back to discovery to check that we’re still answering the right fundamental questions. Our research showed that we need to understand performance on the basis of the journey experienced by a user. We need to be clear about what we are defining as a service, that we’re not just talking about the digital slices. The performance platform has a problem with getting data from a number of different parts of government, indeed within departments and services, getting and sharing data is no easy task. Whilst the product could be improved it won’t be useful if we don’t solve the problem of sharing data. We need to get good quality data, we need to establish the correct rhythm for doing this, and we need to focus on that data which will add the greatest value. We need a strong commitment to obtaining the data across government. Without this, there is almost no point in doing any further product work. Taking any of these themes in isolation won’t solve the problem, and the performance platform team can’t and shouldn’t try to do this alone. We’ll be working with colleagues at GDS and across government to meet the challenge. As part of this work, we will be making some changes to the way we display data on the current performance platform. 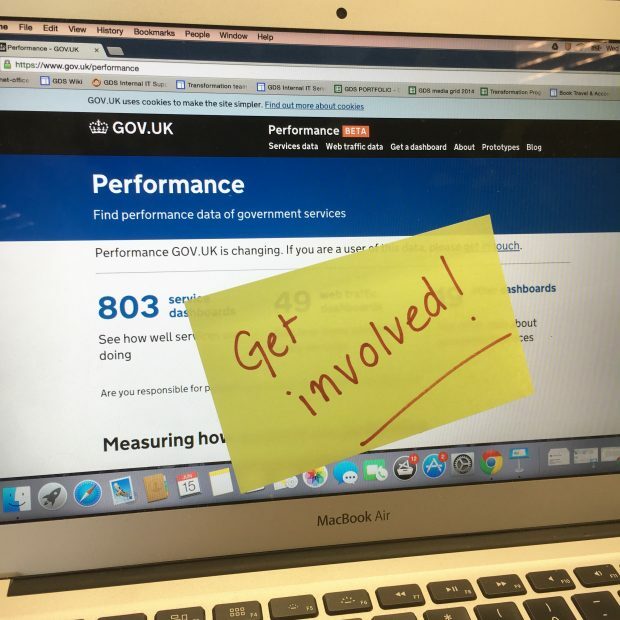 If you’re a user of the data, get in touch to take part in our user research. We'd also like to partner with services to develop clear guidance and make the process of supplying data as easy as possible. If you’d like to get involved, please fill in this form. We're working on metrics that will remain open to the public. "What are the consistent and useful metrics to share centrally and publicly?" Does this imply you won't be sharing publically some of the metrics? Is that because they are exempt from FOI? We publish much of the financial and people management data in the TBS InfoBase (google - top hit). There's still a great deal of performance information in what are currently known as Reports on Plans and Priorities and Departmental Performance Reports, but it is uneven in quality and scattered to the seven winds in various documents. Come July 1st, we will have a new Policy on Results that will make Canada's performance picture much clearer to everyone who is interested. As data comes in, it will be built into the InfoBase, so stay tuned. One current high-level example of our government's spending by program area can be found in the TBS InfoBase here: http://www.tbs-sct.gc.ca/ems-sgd/edb-bdd/index-eng.html#orgs/128/details/table12. Hi Roxanne - We face(d) the same problem with getting data from departments and programs here in Canada. We ended up changing what data our central financial systems collect. Who says non-financial data can't go there? It means that our 130+ federal departments and agencies will all be supplying consistent, database-worthy information on the programs and services they provide. Then it's up to us at the Treasury Board Secretariat to make sure that info makes sense and start using it wherever we can. Hi Derek, do (or did?) you publish that information anywhere?